Dear Miss Upstill : for jazz orchestra / Jenna Cave. Instrumentation: Flugelhorn (doubling trumpet), 3 trumpets, 4 trombones, 5 saxophones, piano, guitar, bass, drums. Featured flugelhorn/trumpet on ballad melody and improvised solo and featured tenor saxophone on improvised solo. I wrote Dear Miss Upstill in 2009. In writing this piece I aimed to create an extended big band work that includes improvised jazz solos while maintaining a strong sense of compositional direction, shape and form. It features solo flugelhorn on a solo ballad melody accompanied by the ensemble. Score: Dear Miss Upstill : for jazz orchestra / Jenna Cave. 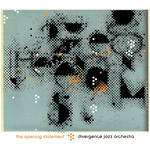 CD: The opening statement / Divergence Jazz Orchestra. CD: Selected works by AMC represented artists : vol. 14 / works by Jenna Cave. CD: Selected Works by AMC Represented Artists, vol. 27.